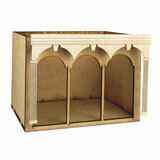 This unfinished MDF kit is just slightly irregular and easily repaired. 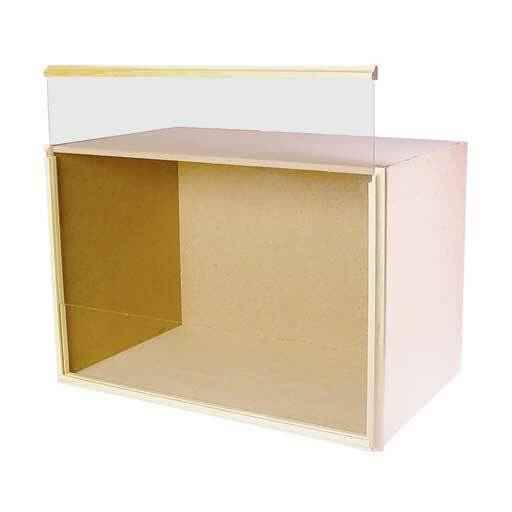 1/8" and 1/4" MDF panels with a sliding acrylic front panel and pine moulding. Gift-giving note: This item ships in a labeled box, so if it is for a gift, you may want to have it shipped to an address different than the recipient's to protect the surprise. I have purchased several of these and made a museum, a garden, a candy store and soon a witch's shop. 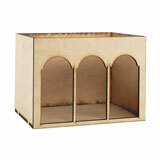 They go together easily and are sturdy once assembled. If you stick with this format, they stack and look great side by side. They do need finishing - both inside and out. But I did most of the work before assembling, to keep things clean. On the whole, a good value.